Generally, the best guide to where a city should build rail lines is where the busiest buses are. However, there are exceptions. I have written two posts about this giving examples of exceptions, and am going to give a third exception; I also intend to write a separate post soon giving a fourth exception. The first post, from four years ago, deals with cases where the bus alignment has to stay on a major street, but some major destinations are just away from the street; a subway can deviate to serve those destinations. Examples include Old Jaffa in Tel Aviv near the north-south spine of bus lines 1 and 25, and Century City near the Wilshire corridor. Here, buses are a good guide to corridor demand, but the rail line should serve microdestinations just outside the corridor. The second post, from last year, is more properly about corridors. It describes street networks that are hostile to surface transit, by featuring narrow, meandering streets. The main example is Boston, especially the Green Line Extension, in a rail right-of-way in a city infamous for its labyrinthine streets. Another example is the Evergreen extension in Vancouver, serving Coquitlam; the bus the extension replaced, the 97-B, meandered through Coquitlam since the streets were so poorly configured, while the extension uses a short tunnel and runs parallel to a railroad. 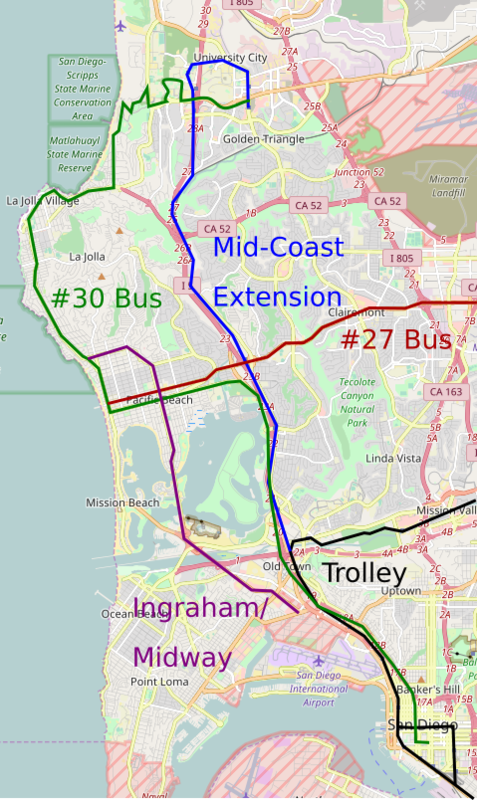 Preexisting light rail (“Trolley”) is in black, the extension (of the Blue Line) in blue, the parallel north-south arterial in purple, and two buses in green and red. The bus ridership on Ingraham is very low: the bus route running on it, 9, has 1,500 riders per weekday (source). The top bus in San Diego, the 7 (going north of downtown, then east), has 11,000. So on the surface, this suggests there isn’t much demand for north-south transit in that area of the city, called Pacific Beach. But that’s wrong, because in an auto-oriented city like any US city except New York, the major streets are determined by car access. The relentless grids of so many North American cities – Chicago, Los Angeles, Toronto, Vancouver – are not just where the buses go, but also where the cars go. Even in Manhattan, if you have the misfortune to find yourself going east-west in a car, you will probably use one of the major two-way streets, like 14th or 42nd, which are less clogged than the one-way streets in between. Non-gridded street networks for the most part obey this rule too – the commercial streets tend to be the wider ones used by car through-traffic. Freeways throw a wrench into this system. They offer a convenient route for cars, but are abominable for commerce. Locations 5 minutes by car from the freeway are good; locations right along the freeway are not, unlike ones right along an arterial road. The main car route from Pacific Beach to the CBD is taking an east-west arterial to the I-5, not going south on Ingraham. This means that the demand for north-south traffic actually shows as strong commerce on east-west streets, hosting bus routes 27 and 30, and not on Ingraham. The 27 has weak ridership, and the 30 has strong ridership but not right along the I-5. But in a sense it doesn’t really matter, because, like the car- and bus-hostile narrow streets of old city centers, the freeway-centric road network in that part of San Diego suppresses bus ridership relative to future rail ridership. In the presence of rail, the strong routes are the ones orthogonal to the rail line. Here, the 27 and 30 already preexist; there is a planned Trolley stop at the intersection with the 27, and presumably the 30 will be rerouted to serve that intersection rather than to duplicate the trains along the freeway. (I tried talking to the transit agency about this, but didn’t get any useful answers.) So the decent east-west bus ridership in Pacific Beach is actually an argument in favor of a north-south rail extension. The city must be auto-oriented enough that car access is crucial to nearly all commercial drags. In Paris, it doesn’t matter how you reach the Peripherique by car, because car ownership is so low. The city should not have a strong mainline rail network, which leads to a hierarchical transit network (buses feeding train stations), in which both buses and cars use the same major streets to reach train stations. This means that Sydney and Melbourne are out, as are German cities short of Berlin and Munich’s transit mode shares. The city must have a strong network of urban freeways, disrupting the street network to the point of siphoning traffic away from the surface streets that would otherwise be the main routes. As it happens, all three elements are present in Tel Aviv. North-south travel within the region uses Ayalon Freeway, inconveniently east of the traditional city center; the city has been building a CBD closer to the freeway, but it’s still not quite there. This suggests that traffic is suppressed on the north-south arterials to the west – Ibn Gabirol (hosting the planned second line of the subway) and Dizengoff (possibly hosting the third) – is suppressed, and those streets require subways. This is in part why, before the Red Line began construction, I argued in favor of putting a north-south subway under Ibn Gabirol, and not under freeway-adjacent Namir Road, where the Red Line goes. In the future, this pattern suggests that Tel Aviv should make sure to build north-south subways under Ibn Gabirol and Dizengoff, and extend them north. The significance of the northern direction is that the effect I’m describing in this post only works when car ownership is high; Israel is poor enough that car ownership is not universal, and in the poorer southern suburbs it is low enough that the buses do give a good guide to corridor demand, whereas in the northern suburbs everyone owns a car. There is likely to be suppressed transit demand in Herzliya, Ramat HaSharon, and northeastern Tel Aviv (including Ramat HaHayal, an edge city with many tech jobs). Thus ridership on a subway line going elevated over Sokolov in Ramat HaSharon and Herzliya, or on Raoul Wallenberg to Ramat HaHayal, is likely to be higher than present-day bus ridership suggests. An American example is Washington’s suburbs. The Metro extensions are planned with little regard for bus ridership. While the Silver Line is bad for multiple reasons – high construction costs, service to too far exurbs, too much branching on an overloaded trunk – the extension to Tysons Corner is its one good aspect. There is no point in discussing bus ridership at an edge city like Tysons – conventional buses wouldn’t be following the same route that the cars follow, and freeway express buses almost universally have trivial ridership. Finally, Vancouver. While Vancouver itself is gridded, its suburbs are much less so. In the suburbs served by the Trans-Canada Highway, especially Surrey, it’s likely that car traffic mostly follows roads feeding the highway. People drive to their jobs in Downtown, Central Broadway, Metrotown, or any of Surrey’s internal centers; there aren’t a lot of park-and-rides at SkyTrain stations, which instead emphasize transit-oriented development, and in Surrey there are actually more park-and-ride spaces at the freeways, with express bus access, than at the one SkyTrain stop with parking, Scott Road. This suggests that there is suppressed bus ridership in Surrey and Langley parallel to the Trans-Canada, along Fraser Highway. Extending SkyTrain in that direction is on a distant priority list for the region, and this theory suggests that it should be moved up, to be just behind the Broadway subway to UBC. In the DC area, this also applies to the Purple Line segment between College Park and New Carrollton. Thanks much for this, Alon. I realize the 4th exemption is what justifies a Northern Blvd. Line in Queens. That said, Northern is waaay down the list of transit priorities compared to (1) reorganization of lines (2) regional rail with lines going to lower Manhattan & Downtown Brooklyn (3) Nostrand and Utica Ave Subways (4) Second Ave Subway & 125th St Subway (5) another trunk line from Queens going into Manhattan, preferably connecting to SAS on 55th St. stop and going crosstown. For D.C., besides your Line reorganization proposal to have (1) the yellow/blue hit Pentagon/L’Enfant/Union Station and rest of Red Line to Silver Spring (2) the Red Line go to RFK Stadium under H St from Union Station, and (3) reduce Blue from Pentagon to Rosslyn to a shuttle, what can be done to mitigate the Orange crush on the Ballston/Rosslyn Corridor? Add more infills from the Airport to Tysons? Stop the Silver at Tysons like the Yellow in Chicago? I think Ballston to RFK via Rosslyn/Foggy Bottom/Farragut/Metro Center/L’Enfant needs its own trunk line with 2-3 minute headways. Reducing the extent of branching in Washington means it’s possible to run more trains per hour. Right now the shared tunnel has a peak capacity of 26 tph, which is really low for a modern system. The highest single figure I know of for a branching line with a driver is M13 here, which supposedly is capable of 38 tph; moreover, the Central line runs 35 tph in the morning peak. This is with the same partial automation that DC has, plus (at least on M13) moving block signaling. So you’d have Orange go from Tysons to Largo or New Carrolton (with Red getting the other Largo/New Carrollton branch from RFK), and shuttle Dulles to Tysons and Vienna to East Falls Church (w/ 4 tracks at Tysons and East Falls Church)? Briefly about the buses in the DC area. The various jurisdictions make an effort to coordinate the bus and subway networks, duly modifying the bus routes whenever a new subway segment opens. Particularly in Virginia, they consolidate routes and encourage riders to switch to the subway at large bus hubs such as at the Pentagon, presumably with an eye to the limited capacity of the highway bridges over the Potomac. The rail situation (the ‘Orange Crush’), basically needs some new subway construction in the District to handle the extra passengers resulting from the new passengers (from the Silver Line) overloading the capacity of the Blue/Orange tunnel at Rosslyn. DC is not really predisposed to build (and especially pay for) an extra line primarily for Virginia commuters. It is difficult to find sufficient local (DC) justification for any new line as the existing system already covers the likely destinations (except Georgetown). A new crossing with a Georgetown station is entirely imaginable, with numerous and fun-to-design routes; the main problem, as usual, is funding. I would 4-track the ROW on both sides of East Falls Church station and build a new segment east, continuing along I-66 to Spout Run, then a bridge or tunnel ending up east of Georgetown University and continuing into Georgetown itself for the fabled station. From there, who knows; probably something involving Union Station, and maybe a loop-around with something connecting to the Yellow Line bridge in the south, perhaps turning the Blue Line into something of a circular route. Things that might be interesting to look at are (a) using Massachusetts Ave. into a new corridor, with the line from Georgetown going next to Dupont Circle, then hitting Mount Vernon Square and Union Station; (b) making K St. more of a corridor – 4 tracking the existing section (they are planning to redo the street for streetcars anyway, so what’s a little more mess) and sending the new line from Georgetown to join it – after McPherson Sq. a new segment continues east along K St to Mount Vernon Square and then Union Station; (c) some combination of those with alternative routings possible in the area of 12th and Massachusetts NW. The (c) variation I like the most is to build variation (a) with a fork at 12th St. NW to connect with the current Blue/Orange tracks at Metro Center and at the same time extend the K St. line (w/o 4 tracking) east to merge with the Mass Ave. Line at Mount Vernon Sq. This would allow for express or local versions of either/both the new East Falls Church to Union Station trip and/or the East Falls Church to Metro Center and the rest of the original line trip. I know that certain parties abhor the branching and recombining here, BUT the express routing this would create would turn the existing 9 stops from East Falls Church to Metro Center (or Mt. Vernon Square) into only 3 – an additional station, say at Lee Highway in Virginia, could even be added and still have a tremendous time savings for commuters. With sufficient trackage for diverging trains to get out of the way of trailing trains at the switches (and the same with room for trains waiting to merge) and with good computer control, the evil side effects could be minimized. There would also be an alternative routing in the event of ‘incidents’ along one of the overlapping sections. The added flexibility and speed would be a big hit with the customers; not to mention Georgetown, at last. Even in Manhattan, if you have the misfortune to find yourself going east-west in a car, you will probably use one of the major two-way streets, like 14th or 42nd, which are less clogged than the one-way streets in between. Nope. Assuming daytime-ish. Go across 26th or 27th instead of 23rd or 34th you’ll get there faster. No buses and not much retail with deliveries double parked. Crazy enough to use the Lincoln to get to the Queens Midtown or vice versa? 30th, 31st or 33rd. I forget which street north of 42nd are buses and taxis only. One of the other ones that don’t have as much retail, pedestrians and deliveries. There isn’t much traffic anywhere at 3AM so that time of night .. maybe not even then. Still have pedestrians, buses and taxis to contend with on the major streets. They have these weird through-routes in Midtown with no turns allowed, like 48th or something. They’re still clogged. East-west road traffic in Manhattan is for masochists. That doesn’t change that it is less masochistic to go across 44th St. versus 42nd. You are in a car, you can do things like that. NYC should build a deep new road tunnel underneath Midtown that connects Queens-Midtown tunnel to the Lincoln tunnel. Once that’s done, cut off surface access from the two tunnels to Manhattan for private cars and demolish some of the ramps. Leave limited Manhattan access for buses or taxis only. All private cars in the two tunnels should be forced to go from Weehawken to Queens, one end to another with no access to Manhattan. It’ll be faster for those who do need to drive East-West and restrict private car access in Manhattan. Not at present-day New York construction costs. The toll would pay for it. Not that there is a whole lot of traffic from Western Queens to Hudson County. You could do the same thing with no tunnel. interestingly, though, on the silver line, the station with the highest ridership is the Wiehle-Reston station. And it’s not all “park-and-ridership” either. While Reston starts from a lower baseline density when compared with Tysons, there is, from personal observation, a substantial contingent of reverse-commute ridership that transfers to and from the Fairfax County Connector bus routes there. Fairfax County Connector ridership in Reston/Herndon was pretty insignificant before the metro, but Metro ridership at that station is definitely not a rounding error (26th out of 91.) That ranking may fall when the next extension segment opens, but I think given Fairfax County’s commitment to steer a large portion of their growth into this corridor, I think any drop will be temporary. So, I don’t quite see the Silver Line through Reston as such a waste as you do. I would hazard a guess that, had the old legacy rail line, the W&OD, been kept in place, you would be easily in favor of upgrading it for electrified regional service. But the W&OD is gone, so there’s no possibility for commuter or regional rail. Yet, this area is already fairly high density given how remote of a suburb it is, and yet there is general political consensus, little in the way of organized opposition, and plenty of potential, towards remaking the areas around each station, even all the way out to Dulles, into high-density nodes of TOD. Previously you have remarked on how Northern Virginia, almost unique within the US, generally does TOD right. I think you will find that the Reston stations will eventually be yet another example of this phenomenon. There is the matter of costs, however. Perhaps the extension wasn’t worth it on the basis of costs. But with costs more in line with the first-world average, I think this line would have been a good idea. sadly, the WO&D was an electrified Regional transit line. Look at one of the early WMATA maps, it shows the WO&D as a metro route to Dulles. Just a correction on the 97B and the Evergreen extension. The road network in Coquitlam is not gridded, but the 97B did not meander. It followed arterial roads, and its route was barely longer than the metro line that replaced it. What the metro really did to boost ridership is offer a better service. Faster, more frequent, and integrated with the rest of the Skytrain system. The 97-B was really indirect to the Coquitlam train station. It served Douglas College okay, though.